We look at credit, debt, and leverage given new data from the Federal Reserve (Fed). We conclude that private sector debt and leverage remain important contributors to both risk and growth. Elevated levels of private sector debt and leverage increase potential risks that should be addressed in portfolios as the cycle ages. Recent data from the Federal Reserve shows private sector debt remains elevated despite some household deleveraging. We continue to believe a relationship exists between private sector debt, the economic cycle, and equity market volatility, and that relationship is stronger today than years ago. The reason why additions to debt and leverage increase equity holder risk is plain. The more debt a company has, the higher the risk to the stockholder in the business. Debt creates a fixed cost, with interest, that increases exposure to market risk. 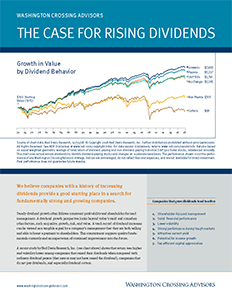 Leverage amplifies changes in asset values, increasing volatility for equity holders.  Chart A, below, is an attempt to show how private sector debt and leverage may have contributed to an increase in market volatility. From 1950 to 1980, the private sector (household plus business) debt-to-income ratio was less than 100%, and the number of volatile days in the market (swings of 3% or more) were just a handful. The debt-to-income ratio rose sharply through the 1980s and so, too, did the number of volatile trading days (36 days during the ‘80s). Through the 1990s, the private sector debt-income ratio moved lower, and equity market volatility declined. Volatile trading days declined to 25 during the 1990s. By the early 2000s, private sector debt-to-income levels were once again on the rise with the ratio reaching nearly 200%, and volatile trading days spiked to 85 from 2000 to 2010. Since then, volatility has subsided as the private sector debt-income ratio came down. These patterns clearly illustrate how private sector debt plays a significant role in contributing to equity market risk. Focusing just on non-financial business debt, we see additional patterns of how debt influences the economic cycle. Here we compare non-financial business debt with after tax income and relate changes in this ratio to the economic cycle. Chart B below illustrates three important points. First, there seems to be a strong relationship between business borrowing and the business cycle. Second, business leverage tends to rise in the second half of expansions, which can help to extend the cycle but tends to raise risk later. 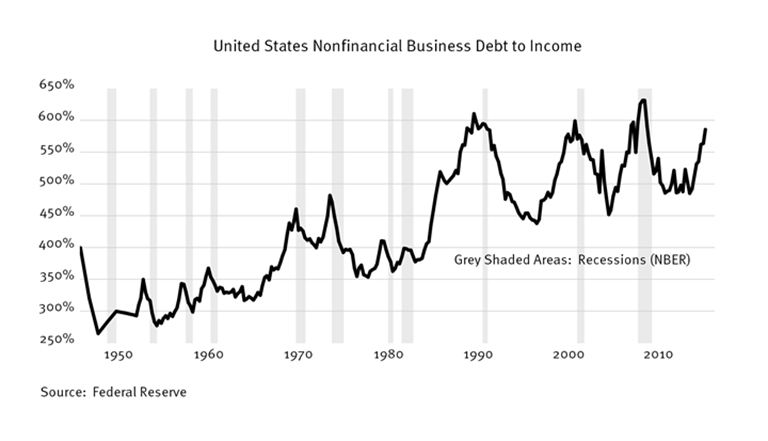 Lastly, the current ratio of business debt-to-income is elevated, and rising toward prior peaks seen in 1990, 2000, and 2007. Today, most data is consistent with an economy accelerating toward 3% annualized growth in the third quarter, but other signs exist we are moving into the later stages of expansion (narrowing output gap, less accommodative fiscal and monetary policy, narrowing term spread, etc.) Eventually, we expect to see another recession and want to be prepared with solid companies in the portfolio whenever that occurs. 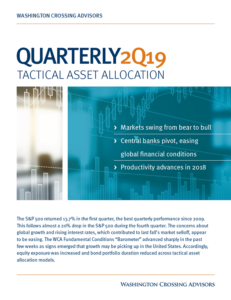 Therefore, we want to increase our focus now on balance sheet strength, cash flow consistency, earnings quality, dividend coverage, valuation, and diversification even if that means sacrificing some near-term return. To reduce unwanted potential risk, we want to remain wary of companies carrying excess debt — especially as business sector debt-to-income ratios remain elevated and are again rising toward prior peak levels.